An Evolutionary Problem — Which Evolved First? Plants and Pollinators. One can’t live without the other. If the plants that need pollination evolved first, how did they survive for millions of years until the pollinators evolved? 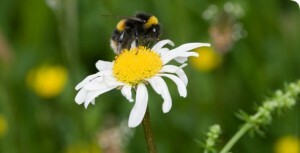 Why didn’t natural selection weed them out long before pollinators arrived on the scene? If the pollinators evolved first, how did they survive for millions of years until plant pollen evolved? Why didn’t natural selection weed them out first? Natural selection is not only “survival of the fittest” — it also says that unused characteristics will disappear over time. If a characteristic is not beneficial to an organism, it will be weeded out by natural selection — those organisms that have the characteristic will be squeezed out by those who don’t. So natural selection becomes very problematic when you have two separate organisms which rely on each other (sometimes known as mutualism or mutualistic symbiosis), or two separate characteristics in the same organism. Which evolved first, the human retina’s ability to invert images or the human brain’s ability to re-invert them so that we see normally? Whichever evolved first, you would have had people who saw everything upside down until the other capability evolved. How did they survive? Why did natural selection not filter them out? There are so many, many “which evolved first” questions in nature. Certainly, evolutionists can come up with speculative theories as to how plants and pollinators could have evolved/survived separately until the second one came along. But how many speculative theories do you need before you begin to say, “Hey, wait a minute, this is getting less and less credible”? There’s an alternative. It is easy to see how plants could survive if the pollinators were created two days after the plants were. If Someone had a plan, and made people with a retina that inverts an image and a brain that reinverts it, and made them both at the same time, then it is easy to see why natural selection wouldn’t filter those characteristics out of existence. If Someone made mycorrhiza, the symbiotic fungus on plant roots, at the same time He made the plants, then we don’t have to ask which evolved first, or how it survived natural selection and prospered before the other evolved. The advocates of atheism and/or evolution want to tell us that this is a matter of settled science, that evolution is the source of the plants and animals we see around us, the origin of the species and the origin of humans. But there are so many niggling little questions, and on some of them, the evolutionist explanations and theories become more and more far-fetched. There is only one eyewitness to the origin of the species, and His name isn’t Darwin. 🙂 Perhaps, since the alternative explanations don’t have very credible explanations for the complexity of the species and some of the other questions, such as “which evolved first”, we’d do better to just accept God’s Word on what happened. After all, He is the One who saw it all. This entry was posted in Uncategorized and tagged Creation, evolution, symbiosis. Bookmark the permalink. 9 Responses to An Evolutionary Problem — Which Evolved First? Just more examples as to the impossibility of evolution. Evolution requires a leap of faith, doesn’t it? Some time ago I read “Evolution: A Theory in Crisis” by Michael Denton (copyright 1985). The subtitle is “New Developments in Science are Challenging Orthodox Darwinism.” In this very accessible book, Denton presents evidence from paleontology to molecular biology showing that classical Darwinism fails. He also shows how a number of recent attempts to address those concerns fail too. But….in the end he said that, even though Darwinism is a failed theory, it will not be replaced and there will not be a paradigm shift until a new theory comes along that fits the data better. 1) science rewrote its field of study about 120 – 150 years ago purposely to ignore anything that was not of the immediately accessible physical universe; and thus redefined reality and things that are true as being only those things that science can deal with. 2) by getting God out of the equation, humans can go about believing the original Lie: “you shall be as god”! Thus they actively stomp down truth and “suppress the truth by their wickedness”—first and foremost their wickedness of ignoring the Creator. But that should never preclude us from pointing these inconsistencies out to folks because all of creation points to the Creator. From the heavens themselves which declare the glory of God to the tiniest particle of the atom that shows forth His wisdom, all things are indeed in order and point to a God of order. And thank you for again shining a light on the creation that shows just how wonderfully and fearfully made we all are—and that our souls should know right well. Good comment, David. (I fixed the typo you told me about, by the way :)). Re: your #1, often the atheist will say that only that which can be proven by science is true and real. Whenever I encounter that, I say, “Can you prove that assertion scientifically?” Of course, it can’t be proven scientifically or logically or any other way. But the problem is not really logical. The logical problems with the exaltation of this twisted form of science are only symptomatic. The real problem, as you noted in #2, is spiritual. But anytime you reject / suppress truth, you’ll end up with many other symptomatic problems as well. I think you can file this one in the file drawer marked “C&E” for Chicken and Egg…. :) It’s a big drawer, as I recall. It is sad that those who espouse the Selection of Species evolutionary lie, typically fail to remember that is was postulated by a Christian as a THEORY and contains a caveat, that if evidence of a mass-extinction ever arose, then the Theory had been debunked and the book was only fit for the trash can. By the evolutionists own assertion, their own “Cambrian Extinction” was such an event and therefore the theory has been debunked by the rules laid down by its creator, or should that be rather, by its own postulator. Another great example of irreducible complexity. Thank you, both. Angus, they know Darwin’s theory was a disaster in scientific terms. It’s been reworked many, many times (and still doesn’t work). Bill, you are always an encouragement to me. It’s a great ministry our Lord has given you in this time of your life. I have no idea why I didn’t pay attention to this earlier, other than I think we were birding that day. One of the few times this summer, I assure you. It’s been crazy busy around here. Your opening about plants and pollinators caught my eye. I’ve been braving the ticks to see what surprises we have in our wannabe prairie. That’s not really the point of my comment. I was thinking about something and shared it with my husband. Many of our plants have medicinal purposes and they were created this way when they would not have been needed before the fall. Papa said in response that God created us knowing we would sin, knowing He would need to send His Son to die for us. I can hardly fathom He would do this for us.